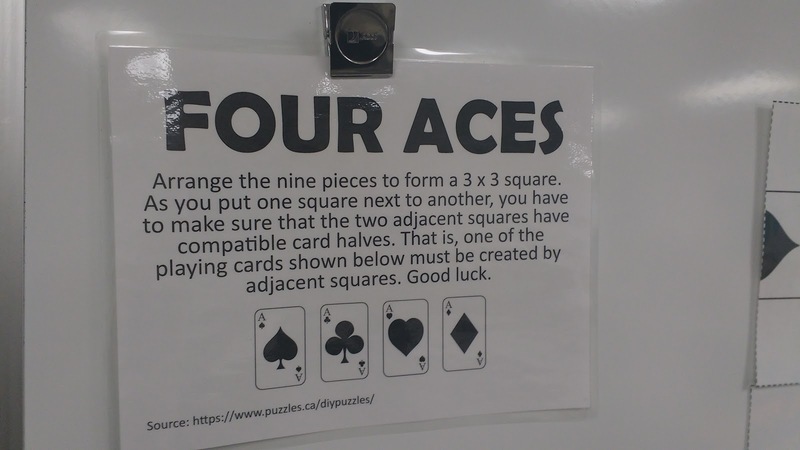 This isn't the first time the Four Aces Puzzle has made an appearance on my blog. It was one of my very first puzzle table puzzles last year. I especially love this puzzle because it is a completely free download from Puzzles.ca. Earlier this year, the puzzle seemed to disappear from their site, but it is back again! In addition to the Four Aces Puzzle, the site also features a number of other free printable puzzles. It's definitely worth checking out. This year with 30 students or nearly that many in the majority of my classes, I don't have the extra space for a puzzle table like I used to have at my old school where my classes tended to have more like 12-16 students. 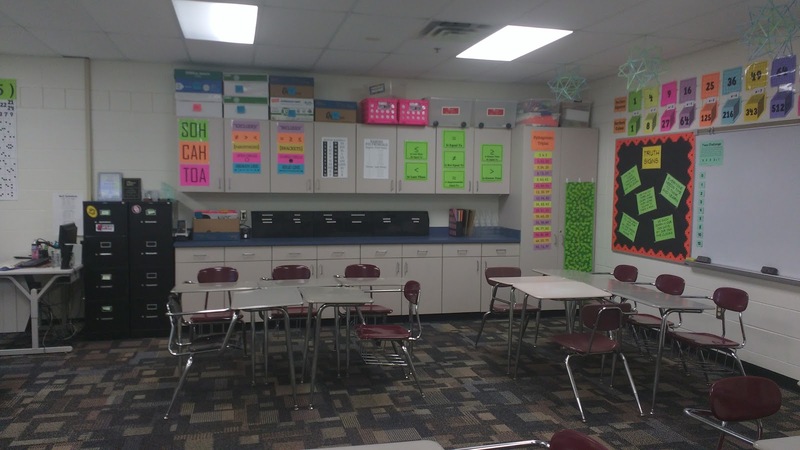 For the first couple of months of the school year, I experimented with storing puzzles in a file organizer (the jungle green organizer on the far right side of the cabinets in the photo below) for students to access when they finished early. For my students the puzzles were pretty much out of sight and thus out of mind. This meant they didn't get the attention that I thought they deserved. 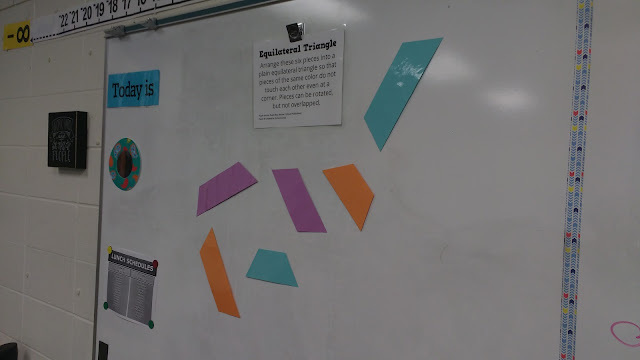 I found that laminating the puzzle pieces (just printed on regular weight colored copy paper) and placing an adhesive magnet on the backed worked perfectly for posting the puzzle on my dry erase board. 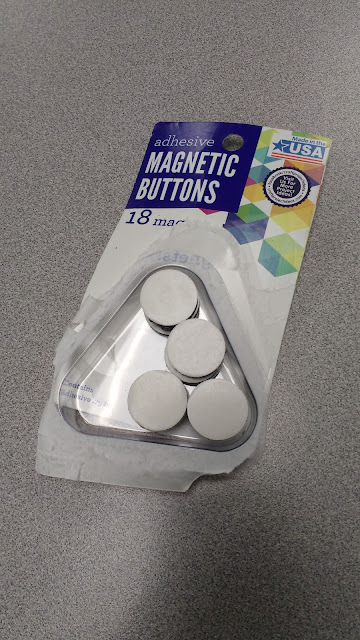 I had previously picked up a package of adhesive magnetic buttons at Walmart for some other forgotten task, and they worked great. If I continue to do magnetic puzzles, I will probably look into buying some adhesive magnets online in bulk to save money. 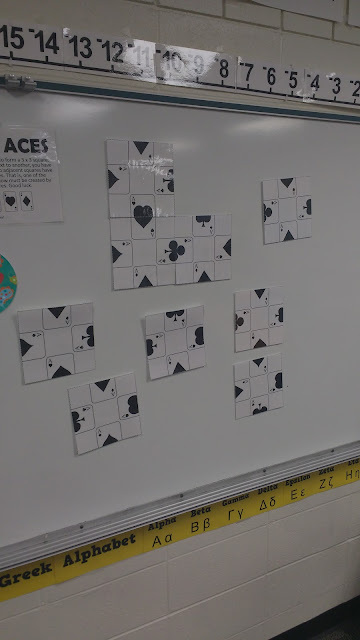 Honestly, it took my students probably three full days before anyone realized that there was a puzzle on the board. I was beginning to think that all my laminating and magneting was a waste. But when one kid found it, it led the entire rest of the class to want to solve it. Then, kids would stay after and play with it which kids in the next hour would notice and then other hours started tackling it. This puzzle became so popular that I regularly had to send kids back to their seats because seven of them would be trying to solve the puzzle as I was trying to start class! 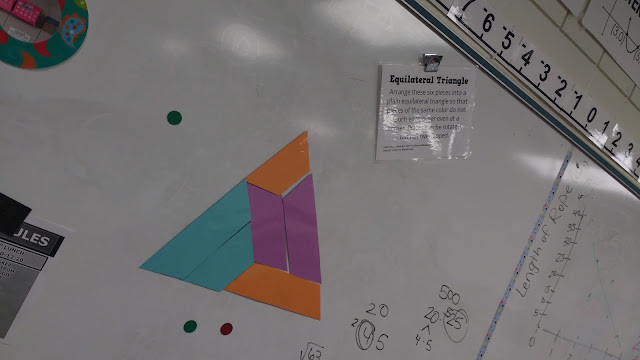 The other problem I ran into was that students would try solving the puzzle and think their solution was correct, but they had neglected to read the instructions. Of course, this was definitely a problem with my puzzle table in the past as well. How, oh how, do we get kids to stop and read directions on a regular basis?!? Life has been CRAZY lately (more about that in another post. I promise!) which means that as much as I loved the idea of magnetic puzzles, I never really got around to changing the puzzle out. (Okay. That's not exactly true. I tried changing out the puzzle several times, but there's something about the way that my school computer does things that two of the puzzles I typed up did not work.) This week, though, I finally became determined that I would get the puzzle changed out. I didn't have time to come up with a new puzzle (blame that on my new preps!) so I turned to an old favorite from last year: the four aces puzzles that I mentioned at the beginning of this post. I'm not sure if my students are intuitive enough to figure out the puzzle without reading the directions or if the kids have suddenly improved at reading directions, but it hasn't really been an issue with this puzzle. 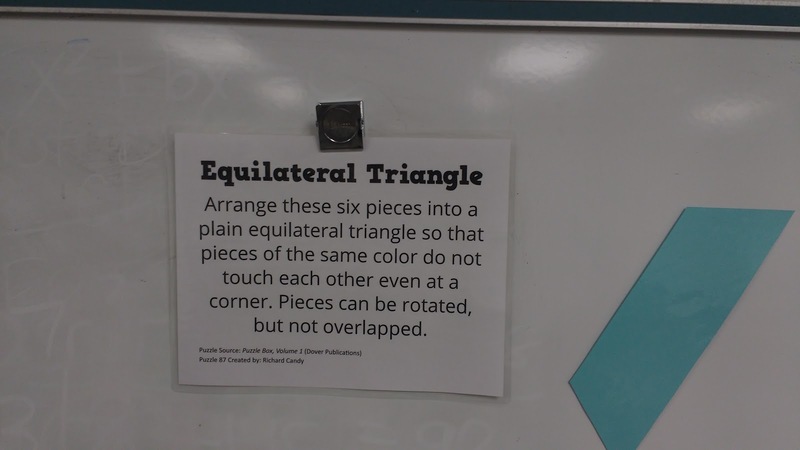 The one problem we have ran into with this puzzle, though, is that it's really hard to check a student's solution at a glance. You have to really get close and make sure that each and every card matches up. The easiest way to do this is by comparing the little symbols on each half of the card. As I have watched students tackle this during the week, I am reminded why I want to do this more often. My goal is to start changing out this puzzle once per week like I used to do on the puzzle table. Hopefully this will help get me back into blogging as I share each week's puzzle with you. So, the nine squares with the aces are all courtesy of Puzzles.ca. I do not want to take any credit for the actual creation of the puzzle. The only thing I have done and will be providing you the file for today is a printable instruction sheet that can be posted next to the puzzle and a jumbo version of the cards to making an interactive display. If you want each kid to tackle this puzzle on their own, you are probably better off just printing the regular PDF version off the Puzzles.ca site. I love that the jumbo version helps to promote students working together in a way that I just haven't been able to achieve with the smaller version. I have uploaded the instruction page and the jumbo version here. Please still visit the Puzzles.ca site to give them some support and check out their other awesome printable puzzles! Thanks for sharing and providing the files and link to the puzzle. 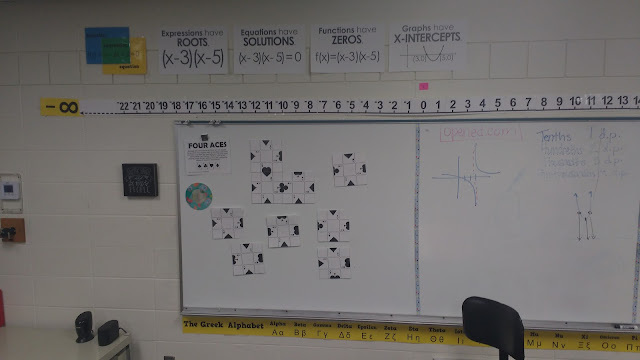 The magnetic version to use on the board is great for promoting student collaboration, especially with a large class like yours. I like that this puzzle looks visually different than many other ones so it challenges the students in ways they may not have seen before. Thank you for sharing your puzzle ideas. I love the idea of using magnets on the whiteboard and could see my students engaging and interacting with their peers during this lesson. Cool activity!